Our second day in Manhattan wasn't nearly as eventful as the first. I guess that's what happens when you cram a million things into a week - by the end of it you just want to sit and relax. We started our day with every intention of hitting up a few TV filming locations followed by a visit to the 9/11 Memorial, but we pretty much did nothing all afternoon aside from chilling in the Upper West Side... where Gossip Girl - one of my most favourite shows of all time - just-so-happened to be filming the first episode for their upcoming (and final) season. Hmmm.... if that wasn't an invitation to sit and star-watch my afternoon away, I don't know what is. And that's exactly what we did. We managed to spot most of the main cast of the Upper East Side's most elite including Blair Waldorf (Leighton Meester), Serena van der Woodsen (Blake Lively), Nate Archibald (Chace Crawford), Serena's new love interest Steven Spence (Barry Watson), and while he was there, we didn't actually get to see my favourite cast member of them all, Chuck Bass (Ed Westwick), due to a stampede of screaming prostitots who were always getting in the way. I may have cried a little. Found: One Gossip Girl filming location. Way too many prostitots snapping photos. I wasn't going to be a creep, but he is too hot to ignore! 1) Honey roasted nuts. If you've ever been to NYC you know that these Nuts 4 Nuts carts are everywhere, especially in Times Square. Unless you're allergic, you absolutely cannot leave the city without buying at least one bag... but I recommend 2 or 3. Or maybe 5. Just trust me on this one. 2) Street meat. I have never liked hot dogs (not even as a child) but I do love a good sausage on a bun from a street vendor. NYC is rumoured to have some of the best, so we had to give it a go. Maybe it was just the particular vendor that we went to or maybe it was because we have much better street meat in Ontario, but neither of us found it to be anything special. Next time, I'll be sure to do a search before I go so that I can make a real judgement call on the matter. 3) Buying cheesy NYC souvenirs at Grand Slam. This place in right in the heart of Times Square and offers three floors of the biggest and best selection of NYC tourist trinkets. Even better - their prices are actually the best in town. Now you know. Best angle I could get with all of the people. Seriously, Thursday nights in the summer = INSANITY...better luck next time? 5) At around 10 or so every night, the sidewalks of Times Square become filled with street vendors. There are food & souvenir carts, painters, caricature artists, people dressed up in costumes of all kinds, you name it*. On night #1 mom found an artist that painted the most elaborate NYC skylines using nothing but spray paint, a frisbee, and a few other random items. 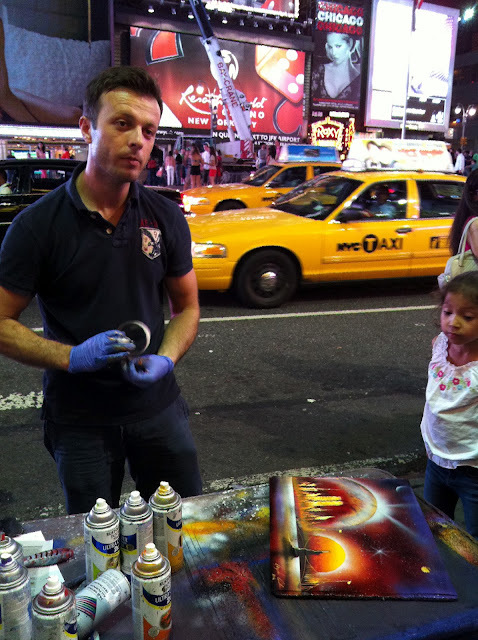 There are a few of these guys around Times Square, but this one made a real show out of it and always had a crowd of people around him admiring his work. On night #2, this was the one thing that mom wanted and she knew just what she wanted him to paint: NYC skyline with a sunset backdrop. You need to watch this video, of him painting her picture... he is seriously so awesome! The artist and his creation. So cool! And it only took 6.5 minutes in total! *Tourist Tip - if you take a picture of anyone performing/looking for attention in Times Square, they DO expect a tip. Be prepared to dart away if they catch you snapping without "paying". And that about sums that adventure up. While I'm sad to have said goodbye (for now), I am super excited for my next visit which will be for a whole week, and I'll have my very best friend with me! I'm already counting down the weeks (49!! ), but can you really blame a girl for being so excited? See you in 2013, NYC!